The V5 is the fifth generation of the world championship-winning Bailey Aviation 4-stroke engine, offering smooth, progressive power with low noise levels and superior fuel consumption. The culmination of 10 years producing engines, the V5 is our lightest and most compact design, offering effortless pull starting and a wide power band from idle to maximum RPM. The engine is available as a manual (pull) start, known as the V5 or an electric start, known as V5E. The V5E comes with 80W engine generator and voltage regulator/rectifier. 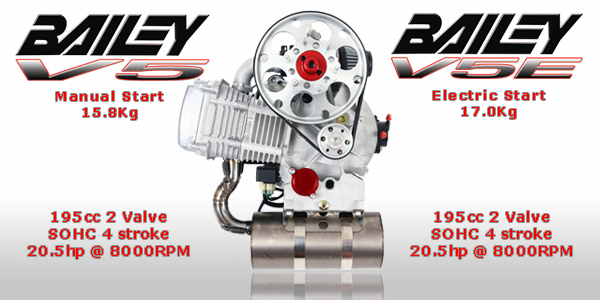 The Bailey V5 engine is a lightweight single cylinder 4-stroke engine with the unique ‘Bailey Easy Start System’ (BESS). This System enables the high compression V5 to be easily pull started by releasing 80% of the compression during cranking. Once started the system automatically disengages. 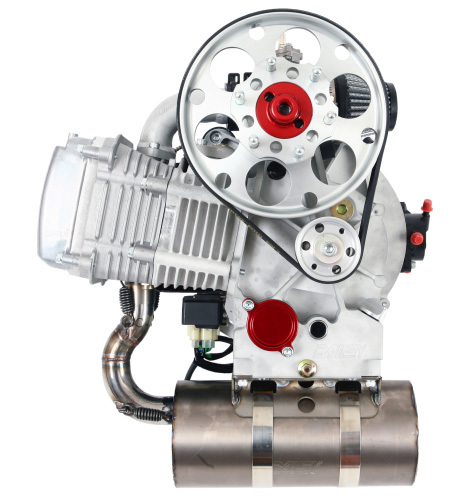 The V5 features a 2-piece CNC machined cast alloy crankcase, has a capacity of 195cc with two valves operated by a chain driven overhead camshaft. The oil system is fully pressurised with a pressure relief valve thus maintaining constant oil pressure regardless of the oil temperature or RPM. The cylinder bore features a special coating for increased wear resistance and the crankshaft design features oversize bearings and an internal needle-roller bearing. The crankshaft runs on two main bearings with a third bearing to accommodate drive belt loads. The integral prop speed reduction unit (PSRU) is driven via a Poly-V belt with eccentric belt tension adjustment. Ignition is CDI (capacitive discharge) with integrated variable advance curve. Carburation is by float type carburettor (CVK26) with a K&N air filter with rubber mounted anti-vibration bracket, fitted to any alloy inlet manifold. Engine cooling is taken care of by our forced air cooling system, using a crankshaft mounted fan, ducted around the cylinder and head by our all-new injection moulded engine cowling, which also neatly houses the pulse fuel pump. The ignition CDI unit is also directly mounted to the engine on a custom bracket, making for an incredibly neat installation. The engine has a 3 stage oil filtering system, with a replaceable oil filter that is easy accessible and a glass oil level window so you can easily check the oil level. The exhaust silencer and downpipe are made from 304 Stainless steel for longevity, with a chrome plated engine-mounted mild steel exhaust bracket which houses our heavy duty sprung exhaust mounting clamps to allow for thermal expansion/contraction of the exhaust under all engine temperatures. Every V5 engine is fully tested on our in-house test rig prior to being signed off for customer release. Please find below schematics of the V5 engine, all dimensions are in mm. Exhaust system, Carburettor, Air filter, Wiring loom, CDI Ignition, Fuel Pump with Tygon fuel line, T-piece and pulse drain hose. Please enquire with our sales office on telephone no. 01763 246660 for full pricing details.